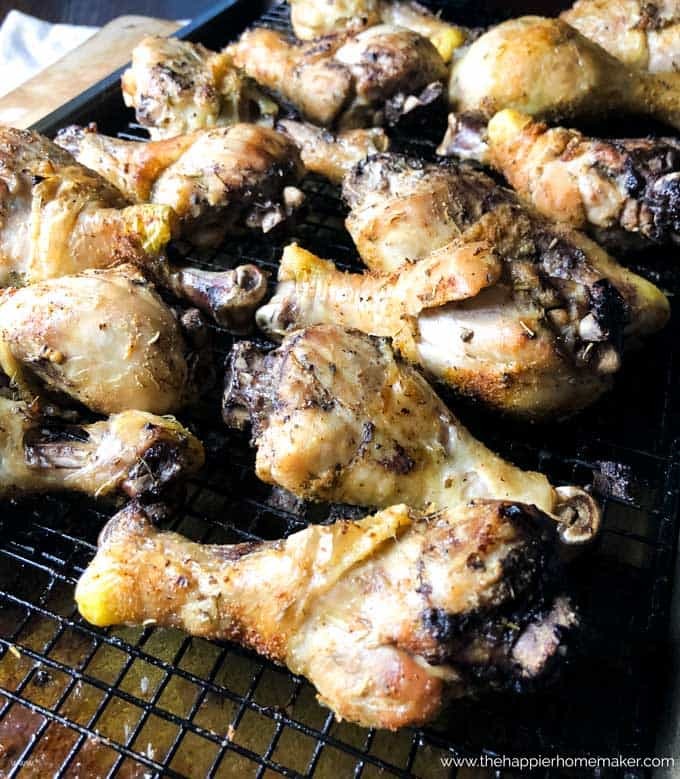 This Crispy Baked Chicken Drumsticks Recipe is the perfect way to cook up those chicken legs so the whole family will love it! These chicken legs are seasoned to perfection and baked up nice and crispy on the outside and juicy inside! This is going to be one of my very favorite recipes in rotation on my meal plan from now on. The seasoning on the outside of these crispy chicken legs is divine, it bakes up perfectly crispy on the outside and juicy and tender inside. They are also easy to prep, which is a bonus for me! You can also make this recipe by baking chicken thighs as well. They turn out just as good as the chicken drumsticks-any part of the chicken leg will do! The key to getting the chicken legs crispy on the outside it not only cooking on the rack as you can see above, letting the juices fall into the pan beneath but also making sure they are dry before you season and bake. 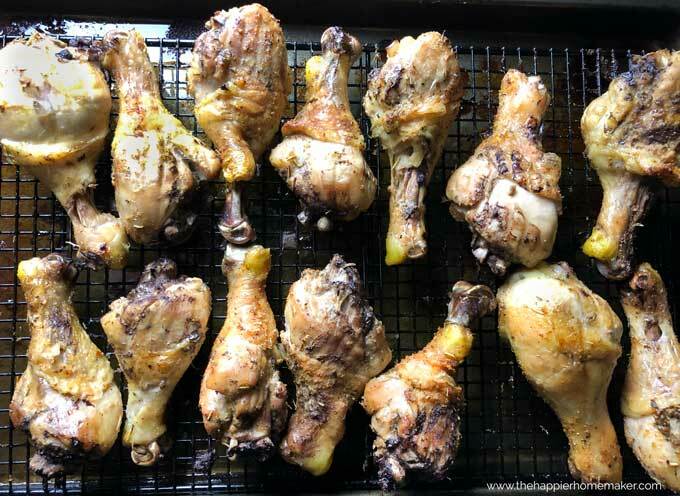 I like to take my drumsticks and rinse them off with water, then lay in a single layer on a baking sheet at least an hour before I plan to start cooking. Then I leave them uncovered in the fridge until I’m ready to season. Before seasoning, blot the drumsticks with a paper towel to dry them as much as possible. This makes a big difference in the crispiness. If crispy skin isn’t your thing, just rinse, blot, then season immediately-they will still taste delicious! Perfectly seasoned chicken drumsticks that bake up crispy on the outside and tender and juicy inside. This is my family’s favorite weeknight recipe! Preheat oven to 425 degrees F. Prepare a baking sheet with a rack on top. Combine all spices in a small bowl and mix. Place prepared chicken in a large bowl and sprinkle with spices. Turn to coat each piece completely. Place chicken in a single layer on prepared pan with rack. Bake for 50 minutes turning chicken after 25 minutes. This recipe can be made with any chicken leg piece, including chicken thighs. Does anyone else’s family have wars over the chicken legs? 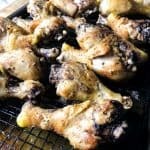 Do you often bake chicken thighs or chicken drumsticks at your house?